Callum Hudson-Odoi’s 10-minute cameo in Saturday’s 2-1 win over Newcastle United may well have been his final appearance for Chelsea. It was only the 18-year-old’s second Premier League outing this season, with both coming off the bench. 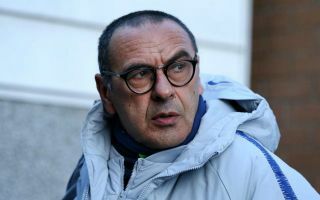 Hudson-Odoi’s has started two Europa League games under manager Maurizio Sarri, plus a further two domestic cup matches, but he is said to be disappointed with his lack of opportunities under the Italian. In fact, The Mail on Sunday report that Hudson-Odoi has lost faith in Sarri’s commitment to developing him. The Mail also claim that the teenager wants Chelsea to let him leave the club this week with a £35million switch to Bayern Munich on the cards. Bayern could do with a boost as they trail Bundesliga rivals Borussia Dortmund by six points after 17 rounds of fixtures. Hudson-Odoi would freshen up an ageing squad and likely put serious pressure on ageing wingers Arjen Robben, 34, and Franck Ribery, 35. Although Hudson-Odoi has failed to nail down a regular starting spot at Stamford Bridge, he has produced some star performances when given the chance to shine. He marked his first senior start under Sarri by bagging a goal and an assist as the Blues battered PAOK 4-0 in November. And he produced two assists on his last start as Chelsea beat Nottingham Forest in the FA Cup.